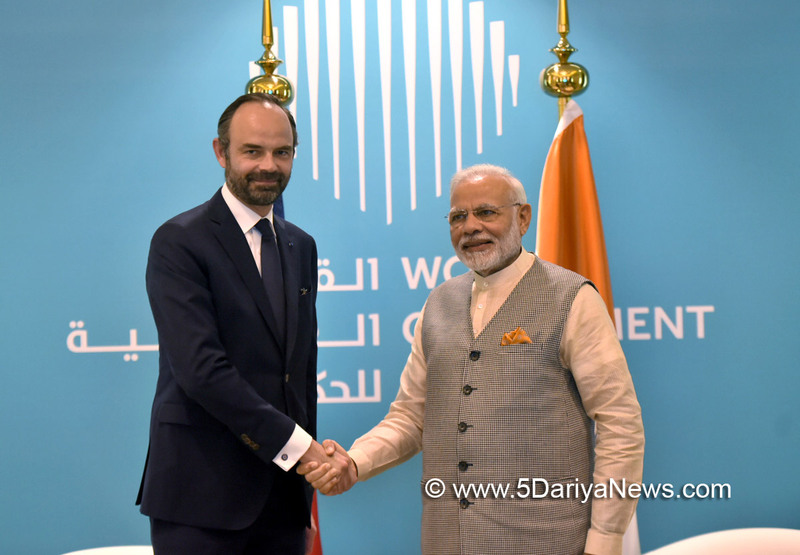 Indian Prime Minister Narendra Modi on Sunday met his French counterpart Edouard Philippe on the sidelines of the World Government Summit here and discussed ways to strengthen the bilateral strategic partnership. "The two leaders had a good discussion on strengthening our strategic partnership," Indian External Affairs Ministry spokesperson Raveesh Kumar tweeted.The India-France relationship was elevated to that of a strategic partnership in 1998.Last year, Modi visited Paris and held his first meeting with French President Emmanuel Macron soon after he assumed office.Macron is scheduled to visit India next month for the inauguration of the India-initiated International Solar Alliance that was proposed by Modi along with then French President Francois Hollande at the 2015 Paris climate summit. "PM (Modi) said that he was looking forward to the visit of French President Macron to India next month," Kumar said.